CROWS and badgers have been leaving a trail of “disturbing” destruction at a large graveyard on a Scottish island. 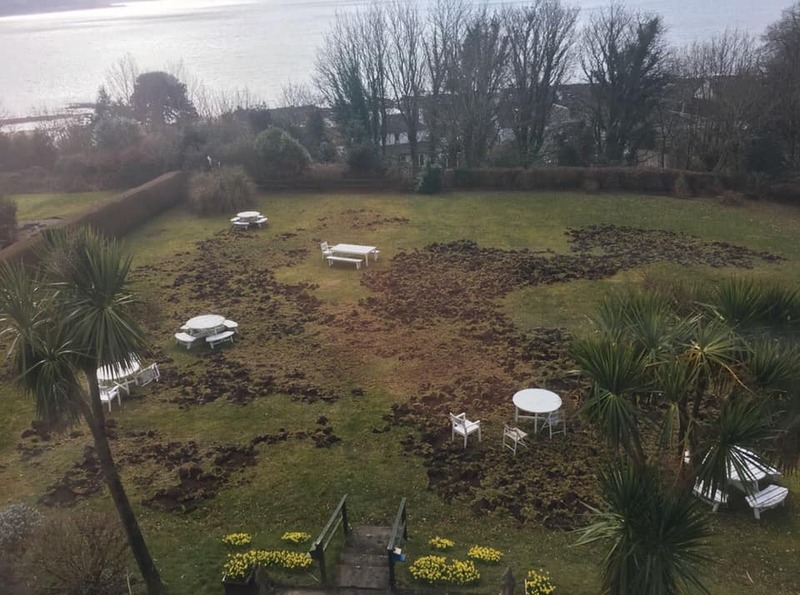 According to local accounts, the animals have been digging up grass and soil at a cemetery in Lamlash on the Isle of Arran, with holes across the graveyard and on top of burial plots. Residents are becoming increasingly distressed by the sight of the dug up graves and multiple holes, some of which have been said to be encroaching on coffins. 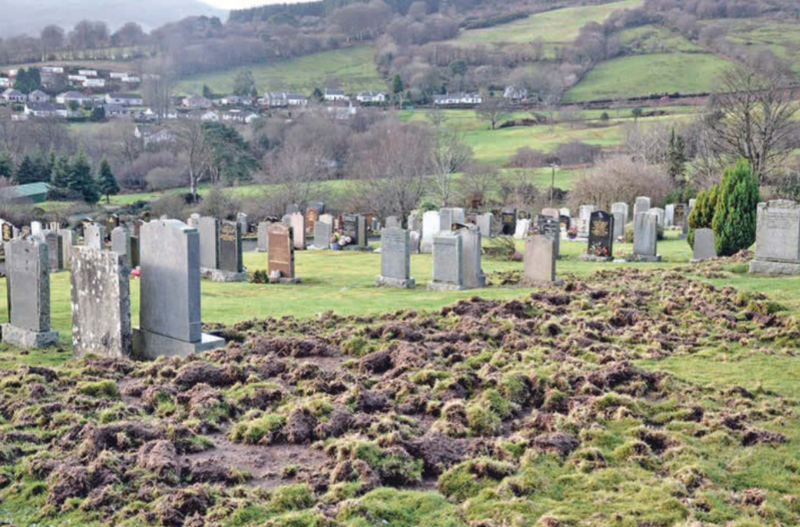 John McGovern, who lives close to the graveyard in Lamlash said: “It’s a heartbreaking sight. “This is people’s final resting place and for family and friends visiting the graves of their loved ones, it’s extremely distressing. “Whenever I walk past I feel very disturbed by it, but there’s little to be done except to try to fix the grass and refill the holes, or to try to prevent the animals from getting in. The problem has arisen multiple times in the past, and according to North Ayrshire Council, had been helped by a badger-proof fence. But locals say an extension of the graveyard has seen the badgers return to the area. Crows have now become a main culprit at graves as they dig up grass and create holes across the cemetery, with no preventative measures currently in place to stop them. It costs £744 to purchase a new burial plot (lair) at Lamlash cemetery. The animals have also been causing severe damage to local golf courses and gardens as they uproot turf foraging for insects. Introduced to the island in the 1800s, badgers have no natural predators on Arran. They are also protected under the Badgers Act of 1992, which states it is an offence to kill, injure or ill-treat a badger or to interfere with a sett by damaging or destroying it, including access to the sett. All wild birds (including crows) their nests and eggs are also protected by Scottish law. Poultry owners on the island have also seen large numbers of their animals eaten or killed by badgers, amid concerns that there has been a further surge in numbers. Nikki Harris from neighbouring village, Whiting Bay has also lost animals to preying badgers. She said: “The devastation of losing your chickens is an awful feeling. “Its nature, I know. We pen the chickens in and their lives depend on the strength of your fence. Kate Sampson, head ranger at Arran Rangers Services said: “At this time of year, badgers are trying to get as much fat on as possible in time for winter, so they’ll be eating and therefore digging as much as they can. “They love areas like big patches of grass that are easy to dig up as they look for worms and bugs to eat. Despite reports from locals, a North Ayrshire Council spokesperson said: “There are no current issues with badgers entering the cemetery as our previous work to install badger fencing appears to be working. We hope to extend this fencing to encompass the recent extension to the cemetery in the near future.